The charm of this paradise is difficult to ignore and resist for many newlyweds. So, if you are ready to start a whole new life with the one you love, then you should consider a magical honeymoon in this little but impressive piece of land: Costa Rica. Then, if you are planning to spend your honeymoon in Costa Rica, this information may interest you. First thing to know is that the best time to come to Costa Rica is between December and mid-April, because of the weather. But of course, those months are the busiest ones and you may find better rates if you travel in low season (rainy season). Also, another important thing to know is that the best way to optimize your budget is to plan the tours you want to include in the trip and combine some private transfers with shuttle options, depending on the destinations you are visiting. This way you will be able to spend more days in Costa Rica, visit more places and enjoying more the time with your couple. If you just checked the packages above and have another great idea for your vacation with your beloved one, then we invite you to contact us and let us know your plans, desires and budget, and one of our travel specialists will be more than glad to assist you preparing every single detail for a perfect honeymoon in Costa Rica. Your wedding is about to happen and after spending a lot of months of planning each detail, the time for a break is well deserved… and the amazing Costa Rica beaches and secluded coastlines of the country are unbeatable for a romantic escapade of rest and relaxation. Here, the hotels offer a great selection of services for honeymooners so if you’d rather indulge in a well-deserved couple time during your honeymoon, you can choose a pampering at your hotel spa. Some of the luxury honeymoon resorts in Costa Rica have completely featured spas with high quality facilities like Jacuzzis, mud baths, massage therapies, facials, stones massages, and other decadent treats that both of you will remember for the rest of your life. Costa Rica is worldwide renowned for its stunning natural beauty and wildlife, and for newlyweds, our unique Costa Rica honeymoon packages are one of the best ways to get away from all the stress of the wedding planning and just focus on what now really matters: you and your partner. The tropical rainforests of Costa Rica are amazingly unique, and after spending an afternoon hiking through the depths of our national parks it’s easy to fall in love with the surroundings and enjoy a fully romantic time while exploring. In addition to the verdant and lush foliage, these rainforests are home to many of the most exotic creatures in the world, a completely breathtaking spectacle for you and your beloved one. During your travel in Costa Rica, anything is possible. You can experience the very best that this place has to offer you not only talking about beautiful scenery, but also taking into consideration the kindness of its people and its delicious typical Costa Rica food. Costa Rica is one of the most popular Central American destinations for honeymooners thanks to its beautiful pristine beaches, its idyllic weather and its spectacular rainforests full of wildlife. This is the perfect destination for couples looking for relaxation and lots of activities and fun. Even when all Costa Rica tourist destinations can be visited for honeymooners, these four spots are highly recommended for couples because of its landscapes, hotels, spas and attractions. Don't forget to include at least one of our suggestions in your Costa Rica honeymoon package and you will never regret it! This is the ideal spot for couples looking for days filled with adventure and nights of relaxation. Why? Because this must-see destination combines a lot of fun activities such as zip lines, hikes through beautiful hanging bridges or even in the Arenal National Park, kayaks, rural tours that will help you to know more about the Costa Rican culture, and relaxing tours with the steamy hot springs as its final attraction. La Fortuna town is located 3 hours away from San Jose and its main attraction is the Arenal Volcano. Private transfers or a car rental are highly recommended, but you can also take a 25 minutes local flightto get there if you don’t want to spend that time on road. 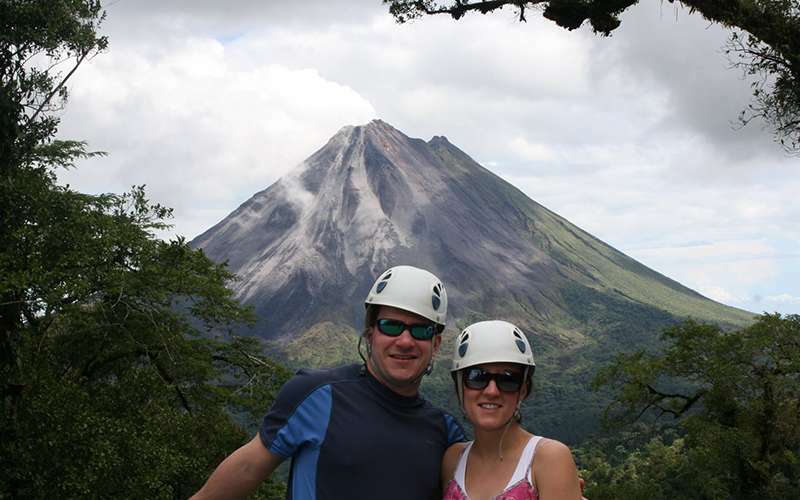 Trip ideas: Combine your stay in Arenal with a morning walk through the hanging bridges, a relaxing massage in one of the best spas of the area, and a romantic dinner next to the hot springs. Manuel Antonio is located in the Central Pacific Coast of the country, just an approximately of 3-hour drive away from Juan Santamaria International Airport. But, you can also take a local flight of 25 minutes to get here, and that will save you a lot of time. This is one of the most popular destinations of the country thanks to the famous Manuel Antonio National Park, which combines a beautiful white sand beach with a lush rainforest. Here there is a great variety of accommodations, so we assure you that you will find the perfect Costa Rica honeymoon bungalow or hotel for this special moment in your lives. Manuel Antonio also has a wide offer of dining options and nightlife, so here you can find from traditional local cuisine to international gourmet dishes that can be a good option during your stay here, if you don’t want to book your meals at the hotel and try new flavors. This spot is perfect for adventurous couples, as here you can enjoy different fun activities such as canopy, white water rafting and rappelling. Trip ideas: Combine your stay in Manuel Antonio with a sunset catamaran, a romantic horseback ride to a waterfall, an amazing snorkeling tour, or a kayak trip through the mangrove. The Papagayo Gulf is the home of the best Costa Rica all-inclusive resorts. This spot is perfect for couples looking for luxury resorts and white and dark sand beaches. To get here, and if you like road trips, you can drive 4 hours approximately from Juan Santamaria International Airport. But if you are not a big fan of long drives, then you can also take a domestic flight of 45 minutes to the Daniel Oduber International Airport, located in Liberia Costa Rica, followed by a ground transfer of 30 minutes from here to your hotel. You and your loved one can also book a domestic flight arriving at other airstrips along Guanacaste; for example, the airstrips located in Tamarindo or Nosara, depending on where you are going, it can save you some time. Guanacaste is full of luxury accommodations, since the development of the area lead to a very new and exciting concept of vacations. Here you can find from small boutique hotels lying on the relaxed beaches of the area -like the recently opened Lagarta Lodge hotel-, to all-inclusive resorts in Costa Rica full of fun activities and without any worries. Dreams Las Mareas is a great option that combines luxury, comfort, and relaxing under the concept of a Costa Rica all-inclusive honeymoon. It is also possible to find vacation rentals to spend a more private and secluded honeymoon. If you like this concept of lodging, then let us tell you that here in Guanacaste you can find excellent options to stay such as Las Catalinas, Reserva Conchal, and Hacienda Pinilla, for example. Trip ideas: Combine your stay in Papagayo Gulf with a full day diving tour and a romantic dinner under the stars. Well, or you can also just stay all day relaxing at the beach; that is not a bad idea at all! You can also take sport fishing tours, ATV’s, romantic horseback ridings amidst beautiful landscapes, snorkeling tours, challenging hiking or rafting tours in the middle of the forests, and much more. As a ground transfer can take you from 7 to 8 hours, we recommend taking a local flight of 45 minutes to get here. This spot is ideal for nature lovers who are interested in an active and unique experience in the rainforest. Here, you and your loved one can be totally disconnected from the noise of the routine and the big cities, while spending some quality time together. We strongly recommend this honeymoon destination in Costa Rica if you want to enjoy an off the beaten path honeymoon. The place is truly exotic and the lush rainforest will be surrounding you all time and it is possible to see and discover a whole new world of flora and wildlife.Once you landed here you will feel like you are arriving to a magical land and the transportation of your rainforest hotel in Costa Rica will be waiting for you to take you to your home away from home for the next few days. There are many hotel options that will make you feel so comfortable and relaxed here; the perfect choice for a romantic escapade. While staying here, you will have a lot of possibilities to enjoy and discover. Night walks, yoga classes, stand up paddling, and whales and dolphins watching tours are very popular activities here. Trip ideas: Combine your stay in the Osa Peninsula with a full day hike in the world's famous Corcovado National Park and a glass of wine at the end of the day with your loved one in this secluded paradise. In the next section of this Costa Rica honeymoon guide you will find the recommendations of lodging that we consider the most appropriate for your honeymoon vacations in Costa Rica. Please note that we are offering the best hotels in each area, according to quality of the service, privacy, honeymoon amenities, spas, comfort or luxury, and romantic settings; just to help you decide in which one of these you want to spend this unforgettable moment for both of you. This selection of hotels can create the perfect romantic setting you are looking for your honeymoon in Costa Rica. From cozy boutique hotels where you can enjoy a special candlelight dinner overlooking some of the world's most beautiful rainforests to luxury beach hotels where you can relax seeing a breathtaking sunset after a whole day of adventure. Your honeymoon hotel can be exactly as you imagine it! Before starting to investigate about the perfect hotel for your honeymoon vacation take a look to these 18 hotels we strongly recommend you. Then, you will find some links with more information and with other great options for your special holidays in Costa Rica. Situated on a shady street just off Paseo Colon, San Jose’s main thoroughfare, Grano de Oro Hotel is a true oasis, a sanctuary in the heart of the city. Converted from a Tropical Victorian mansion, this 40-room hotel maintains the warmth and comfort of a private home. Hallways lined with period photographs and original art meander through the building and present lush tropical flower arrangements and luxurious plants at every turn. Spanish tile fountains grace intimate atriums, ensuring that one is never far from the soothing melody of falling water. All rooms are individually decorated and equipped with fan, air conditioning, cable TV, telephone, safe deposit box and minibar. Restaurant Grano de Oro merges Costa Rican tropical with European cuisine under the expertise of French chef Francis Canal. Once a simple cafe, this restaurant has evolved into one of San Jose’s finest dining establishments, frequented by locals and tourists alike. Why? One of the Central Valley's best restaurant experiences, unique urban boutique hotel experience, great way to start of finish a Costa Rican vacation. Located in Santa Barbara de Heredia, at only 15 minutes away from the Juan Santamaria International Airport, Finca Rosa Blanca Coffee Plantation & Inn is an artistic, free-form designed property, set in an organic coffee plantation. This luxury sustainable hotel offers two extraordinary Master Suites, and eleven elegant Junior Suites, four of which can be united to form two spacious villas. Each room is decorated with original hand painted murals and includes Jacuzzi baths and mini bars. They either have a private veranda overlooking the Central Valley and the volcanoes above or a secluded patio surrounded by lush colorful gardens. The spring fed pool contains chemical free water and a 12-foot cascading waterfall. Above the deck of the pool is a hot tub- Jacuzzi surrounded by a sculptural pergola covered with flowers. Finca Rosa Blanca is renowned for its exclusive and in-depth coffee tour of its own organic sustainable coffee farm. There is also the Cultural Highlands Tour visiting the colonial town of Barba and the Sustainability Tour (free upon availability of guides). Hiking to Barba Volcano, bird watching and horse riding are some other possible activities. Contact us if you want to know more about these interesting optional Costa Rica tours. Finca Rosa Blanca is not only famous for its creative architecture and its organic coffee plantation, but also renowned for its fresh and delicious cuisine. In addition to the El Tigre Vestido Restaurant, the coffee bar is surrounded by sacks of freshly roasted coffee and decorated with hand-painted ceramic tiles. Guests will certainly enjoy sitting at the bar to sip an aromatic and delicious espresso or taste a cold Costa Rican beer. The bar overlooks the valley below and the neighboring coffee plantations and enjoys the fresh breezes from the volcanoes and mountains above. At El Tagua Spa, guests can enjoy a relaxing and refreshing massage, a hot stone aromatherapy massage or an organic coffee body scrub. An ideal way to enjoy a relaxing moment in couple! This splendid and cozy property is located at only 15 minutes away from Juan Santamaria International Airport, and a few minutes from the city of Alajuela. The hotel features 23 individually designed villas of different categories for you to choose. All villas feature private garden terraces and panoramic views of the Central Valley. Each villa is equipped with a mini bar, coffee maker, telephone, alarm clock, safe deposit box, living room and large view terrace and private veranda. A trail walk through botanic gardens leads to the main building, or an electric cart is available on-call. The Spa village is set in a tropical garden. A wide range of spa treatments are offered in five private jalapas, each with an open air jacuzzi overlooking the Central Valley. The indoor/outdoor restaurant features a healthy continental and Costa Rican food menu. Many of the fruits and vegetables are from their own organic greenhouse, orchard and gardens. Continental Breakfast is complimentary. Besides, the property has three lap swimming pools and a heated outdoor Jacuzzi, over four kilometers of private scenic trails and five waterfalls. Xandari is dedicated to a comprehensive program to diminish the environmental impact of hotel’s operations and to return much of the land to its original natural beauty. Guests can learn more by taking the Sustainability Tour, free of charge, or by planting a tree. A great way to fill your honeymoon with some symbolism too! Xandari Resort & Spa is ideal for honeymooners... we assure you that! Arenal Nayara Hotel & Gardens is located between de town of La Fortuna and the Arenal Volcano National Park, 20 minutes from the main attractions of the area, including hot springs, waterfalls and the National Park main entrance. Every room at the Arenal Nayara Hotel & Gardens has been designed to provide the upmost in comfort while maintaining a close contact with the natural surroundings. Each of the 44 spacious casitas (bungalows) of this Costa Rica hotel features a secluded garden with an outdoor shower and a beautiful terrace with a private and intimate Jacuzzi for two. The Altamira Restaurant offers an exceptional vista of the active volcano and houses a lounge area to enjoy a drink in a stylish and comfortable ambiance. Guests can also have tropical cocktails, fresh fruit juices and light snacks at Kali-Kali wet bar, near the pool. The Spa, perched above the tropical rain forest, allows guests to enjoy the best of Costa Rica’s natural healing ingredients, from coffee to volcanic mud. These relaxing treatments are enhanced and heightened by the soothing, harmonizing sounds of birds, flowing water and the forest breeze. Nostalgia is an entirely new concept wine bar, where guests can sip and sample the best of Latin American and Spanish vintages using a unique Italian wine dispensing system. If you are looking for luxury and tranquility, then this is your ideal honeymoon resort in Costa Rica! At only 10 minutes away from La Fortuna, Arenal Kioro hotel is located on a hill top, right in front of Arenal Volcano offering the most breathtaking views of the valley below and the volcano above. The hotel has 27 acres of undulating land, surrounded by two streams of crystalline waters. It features 53 two-terrace suites equipped with air conditioning, cable TV, telephone, radio alarm clock, free Internet access, coffee maker, mini bar, safe deposit box, hair dryer and a great Jacuzzi overlooking the volcano. Rooms for disabled guests are also available. Neidín Spa offers a great variety of facial and body treatments that provides peace and relaxation. There are also seven thermal hot springs of volcanic origin, containing minerals good for the skin. In addition, guests have free access to exclusive Titokú Hot Springs, located off premises, five minutes away from the hotel, and featuring eight hot spring pools with hydro-massage of different temperatures. This luxurious property offers four dining options: Heliconias Restaurant, in the main building, with a panoramic view of the volcano; Orquídeas, a casual restaurant next to the swimming pool; El Pilón, for group reservations and El Higuerón Bar, next to the hot springs. This hotel is a perfect place for a family retreat in Costa Rica or a honeymoon getaway and we highly recommend it! El Silencio Lodge & Spa is an eco-luxury hotel located in the tropical cloud forest of the central volcanic valley, in Los Bajos del Toro, a small rural town, 90 minutes from Juan Santamaria International Costa Rica Airport. The property lies in a 500-acre private reserve, blessed with gently flowing creeks and hidden waterfalls. The main building faces the base of a tree-lined canyon and houses the restaurant, coffee lounge, media room, reception office, gift shop and a large outdoor deck area. The hotel has sixteen upscale cottage suites interspersed in a tiered layout. Each suite sits on above-ground pillars to respect the forest’s natural topography and features bamboo ceiling tiles, energy-efficient lighting and a gas fireplace. They also have premium amenities, a king bed and a sofa bed, a viewing deck with rocking chairs, complimentary daily in-room health snacks, an enticing outdoor whirlpool tub and spectacular mountain or river vistas. Guests can indulge themselves in the Esencia Spa where the flowing water, the whispering breeze and the flicker of candles converge into the perfect harmony for relaxing massages, facials and body wraps There is also a yoga deck and a conical room designed to channel the forest’s life energy. At Las Ventanas Restaurant, dishes include regional fish, poultry and vegetarian entrees. 100% of the ingredients are regional, minimizing transportation impact, favoring the local economy and ensuring freshness. Nearby attractions include the well-known Poas Volcano, Sarchí arts and crafts, Zarcero famous park and Arenal Volcano. Horseback riding, river rafting, mountain biking and canopy zip-lining are some of the activities available. Guests’ favorite activities in the lodge include the tree-planting ceremony, picking organic veggies from El Silencio’s own garden and the new Elementos trail, a holistic journey that incorporates stations to focus on a particular sensory experience. This is a super romantic place! You must consider a visit here if you want to experience true love and harmony with your couple and with nature too! Developed in full synergy with its neighboring communities, Hotel Punta Islita is a premium beachfront getaway featuring the charm, culture, and bewildering natural biodiversity of Costa Rica and its Guanacaste province. Perfect for romantic getaways, honeymoons, and relaxation escapes. Tropical dry forest surrounds the hotel property and treats visitors with its unique flora and fauna. Punta Islita’s tiered layout grants spectacular ocean views and seclusion. This luxury Costa Rica beachfront resort offers world-class facilities for fine dining, relaxation, spa treatments, eco-adventures, and beach activities. It features 32 guestrooms and 22 Villas of different categories. All guestrooms have a private terrace, air conditioning, cable TV, telephone, coffee maker, mini bar, bathroom with a bathtub and hair dryer. In addition, villas are completely equipped and have a private swimming pool. Local fresh ingredients are the signature elements of Hotel Punta Islita’s dining options. Featuring distinct ambiances, its restaurants entice guests with exciting tropical flavors served with Costa Rican flair. The infinity-edge pool sits at the pinnacle of the property and it seems to merge with the ocean horizon. Trimmed by a deck and shaded lounging areas, it is also the perfect place for reading and relaxing under the sun. Exhilarating mountain and beach cove views will inspire a great workout! Punta Islita’s air-conditioned Exercise Room features a treadmill, a stepper, a spinning bike, free weights, and a multi-exercise station. If you and your beloved one love to exercise together, then this is a plus during your stay! Over 85% of Hotel Punta Islita’s staff are local men and women who have found their professional calling as managers, sous-chefs, bartenders, spa therapists, tour guides, landscapers, and maintenance and security professionals. Hotel Punta Islita holds a four-leaf rating from the Costa Rican tourism board’s Certification in Sustainable Tourism program (CST). This initiative evaluates travel services companies according to their level of compliance with responsible tourism practices. Built on an impressive mountain ridge, overlooking the whale-tale-shaped sandbar of Uvita de Osa, Kurà Design Villas is an adults-only exclusive boutique hotel on the South Pacific Coast of the country, where the Osa Peninsula rain forest covered mountains tumble on to pristine Costa Rica beaches. Featuring six luxury villas, an infinity salt-water pool and a spectacular outdoor poolside lounge and Spa area, Kurà is the perfect place to indulge your senses. All six of its exclusive villas reflect a clean, tropical, minimalism style and share an open-floor design featuring a king-sized bed, a spacious private terrace with a glass veranda, a double rain shower with ocean view, bathrobes and towels, a sliding-glass-door façade for a gentle, free-flowing sea breeze, ceiling fans, AC system, binoculars, free wireless internet, private minibar, wine cellar, espresso coffee machine and a safety deposit box. Living in harmony with the surroundings, the hotel incorporates responsible alternative sources of energy such as solar panels, solar water heaters, rainwater collection systems, energy efficient fans, and LED lighting. The elegant pool lounge and bar area offers an uninterrupted, 180-degree view of the Pacific horizon. Kurà guests can discover Costa Rican fusion cuisine at the restaurant, which has developed a concept of using local, primary, organic tropical ingredients to present a creative yet simple menu. The Spa, with its serene setting and magnificent view to the sea, offers a selection of wellness and beauty treatments: facials, massages, body wraps, scrubs and deep tub soaking. There is no doubt that nature blessed this region with countless natural attractions ideal for eco, cultural and adventure tourism. Half-day whale watching or snorkeling Costa Rica tours are offered, depending on the season. You might see the pilot whales or the bottlenose and spotted dolphins, which are residents of the Uvita coast. This depends of the season you are coming, if it is “whales’ season” then maybe you will be blessed by nature with a truly magnificent spectacle! Kura Design Villas is recommended only for adults. Those under 16 years of age are not permitted, but they are welcomed when one party occupies the hotel. Here, ensconced in tranquility, luxury, privacy and comfort, the city is left behind and genuine relaxation begins. Therefore, there is no television, but each villa is equipped with an iPad and free Wi-Fi. You must take a romantic advantage of this “no TV” plus! Accessible only by boat, Playa Cativo Eco Lodge is nestled in the tranquil waters of Golfo Dulce, in Southern Costa Rica. Playa Cativo is a beachfront boutique hotel set on 1,000 acres (400 hectares) of private rainforest, surrounded by the Piedras Blancas National Park. This park offers visitors a chance to encounter rare and fascinating creatures, including all four species of monkeys found in Costa Rica (capuchin, howler, spider and squirrel), white-nosed coatis, two species of deer, kinkajous, agoutis, peccaries and sloths. Although rarely seen during the day, the Park is home to five species of cats: jaguars, pumas, ocelots, margays and jaguarondis. This exquisite Eco Lodge offers total comfort and personalized service. It offers only 7 guest rooms (two deluxe rooms, two luxury rooms and three premium rooms); all of them are just a few steps from the beach. Bathrooms include rain showers, biodegradable bathroom amenities and cotton bathrobes. Guests will also appreciate the organic and gourmet restaurant with a view of Golfo Dulce. El Gavilán Restaurant features à la carte meals prepared by an experienced chef with fresh ingredients from the farm and other local purveyors. In Playa Cativo, guests can also practice snorkeling, kayaking, paddle boarding, hiking and birdwatching. Set in a private nature reserve, spread over 1,000 acres of rainforest, Lapa Rios Ecolodge overlooks the pristine point where the Golfo Dulce meets the Pacific Ocean. Built in harmony with the surrounding forest and beach, the main lodge and bungalows are connected by paths and steps. Sixteen spacious bungalows nestled within the rainforest exude tranquility. Lapa Rios is a model ecotourism project that exemplifies why “a forest left standing is worth more than one cut down”. It is an ideal vacation in Costa Rica experience for nature lovers, people willing to know more about conservation culture and biodiversity, honeymoon couples looking for a unique kind of experience wanting to spend some real quality time together. Activities at Lapa Rios are focused around the rainforest and the nearby ocean: rainforest hikes, bird watching, ocean kayaking, horseback riding or surfing. All guided tours help support the ongoing maintenance and land preservation of the rich Osa Peninsula biodiversity. Choosing to hike and learn about the rainforest interconnectedness, with a trained and experienced local guide will provide an authentic local interpretation and will help the community employee’s economic support. Guests can enjoy a relaxing massage, participate in yoga classes, relax at the pool with a tropical cocktail or just doze away in a hammock. Lapa Rios has won worldwide awards for social and environmental excellence, and it is featured as a sustainable tourism pioneer in many international publications and research projects. The Eco Lodge employs only local community members, is committed to environmentally sound practices and has been awarded Costa Rica’s highest sustainable tourism certification (CST). Casa Corcovado Jungle Lodge is the closest to Corcovado National Park, the last remaining Pacific lowland rainforest of sustainable size in Central America. Located on the Osa Peninsula, Corcovado is the "crown jewel" of a world-renowned national park system. Tucked away in the trees and cooled by the Pacific Ocean, Casa Corcovado Jungle Lodge is a 170-acre private reserve bordering Corcovado National Park. Carefully designed and built by an American naturalist with over thirty years of local experience, this unique lodge offers accommodations constructed with the highest concern for conservation, in harmony with the landscape and the environment. The lodge provides four honeymoon suites, six deluxe bungalows and four junior suites. All accommodation units feature ceiling fan, lounge area, safety deposit box, hammock and 24-hour electricity. The deluxe bungalows and junior suites offer even more space and the junior suites have a comfortable porch. Mealtimes are special in Los Vitrales Restaurant as guests enjoy the casual elegance of the lovely Jungle Dining Room. Meals are prepared with fresh ingredients, style and originality. For an exotic cocktail or just a refreshing drink, guests can join the Margarita Sunset Point while watching a breathtaking sunset over the Pacific Ocean and perhaps even the chance to spot some whales. Casa Corcovado offers two swimming pools: the main pool, El Solar, divided into a children and adult section using only solar energy to recycle the water and a spring-fed pool hidden away in the forest. Further facilities include El Bosque bar, Spa services, daily laundry service and meeting and lounge area. This lodge is located in the heart of Los Santos Forest Reserve, some 80 km from San José, very close to the newly created Los Quetzales National Park. It has eight luxurious bungalows. All rooms offer a spectacular view of the valley and the cloud-covered mountains. Every bungalow of Dantica Lodge and Gallery features one or two bedrooms with private terrace, large glass windows, goose-feather duvets, heating, mini bar, coffee maker, satellite TV, Jacuzzi, hair dryer and safe deposit box. In addition, the four-person bungalows have a living room with a fully equipped kitchen. The Suite is larger and has a fireplace, a sunken Jacuzzi and a private forest garden with its own trail. The restaurant is opened from 7 a.m. A delicious pick-nick basket is also available for guests to take on a walk or a tour. A walking trail system provides access to nearby 20-hectare private cloud forest reserve, excellent for bird watching in Costa Rica –this valley is one of the best places to see the resplendent Quetzal. If you are bird lovers, then a romantic getaway in the middle of the forest will give you not only the opportunity to spot magnificent wildlife, but also to enjoy an unforgettable moment for the both of you! Member of Auberge Collection Resorts, Alta Gracia sits high in the mountains of Perez Zeledon, in the Southern region of Costa Rica, one of the country's last-to-be-discovered hideaways. Fitted with its own airstrip and helipad, it is a mere 25 minutes by air from San Jose, aboard one of the hotel's private airplanes. The scenic route by land takes two and a half hours of beautiful driving. This Boutique Hacienda features 20 one-bedroom Deluxe Casitas, 14 one-bedroom Premium Casitas, 8 one-bedroom Mater Casitas and 8 two-bedroom Casitas. Each Casita was designed and decorated to complement the surroundings with its own personality and color palette. The Casitas feature generous living spaces, Chef Pantries, fireplaces and panoramic terraces; as well as traditional in-room amenities such as safety boxes, flat screens in living and bedroom spaces, iPod docking stations, pillow menu, among others. The location and architectural design were carefully planned to allow maximum privacy and the best views of the surrounding scenery from every independent Casita. Discover a great culinary experience and a wide variety of dining options from the Master Chef, who combines the best of fusion and authentic regional cuisine with a farm to table concept. AltaGracia is a must for all those travelers who are passionate for horses. A knowledgeable team of equestrian instructors will arrange unique ridings, featuring breed horses for all levels, private trails throughout the property, 28 indoor stables, a saddle room and guided tours. The Boutique Hacienda’s enclosed riding ring offers a venue to practice day and night horseback riding, to host shows and equine events, and is ideal for special occasions. Relaxation is mandatory in Manantial Spa, where guests can not only pamper themselves in the best of hands, but also enjoy the encompassing sights and sounds of nature. It features 6 indoor treatment rooms, a panoramic pool with a breath-taking view of the valley, as well as 4 outdoor ranchos, a top-of-the-line fitness center and a professional beauty salon. This lush property exemplifies warmhearted splendor, introducing its guests to a different kind of Costa Rica, one that promotes the peaceful and serene wonders of its greenery, its elements and their pureness. You won’t regret coming here. This is the ideal place if you are looking a secluded place with luxury pampering for you and your couple, and exquisite dining options for your Costa Rica honeymoon! In the Caribbean region of Costa Rica, there is a protected zone of incomparable beauty that begins near the town of Siquirres and covers approximately 25,000 acres as it descends down the Talamanca Mountain Range. Deep inside this protected zone, perched on the banks of its enchanting Pacuare River, lies the singular Pacuare Lodge. The lodge offers 19 bungalows of different categories. All bungalows were built with special attention to the hillside’s topography and are equipped with solar heated shower, private terrace and hardwood flooring; some of these bungalows have a private deck with a pool. You can arrive to the lodge either by river or by land, or a combination of the two. Arrival by river takes you along scenic class III rapids, and departure by river allows you to experience the magnificence of this zone’s canyons and primary rainforest, via class III and IV rapids. You may also plan your arrival by ground transportation through impressive scenery and cross the river on a hanging gondola. A departure by ground transportation is also available, providing an alternative for families and others guests who prefer dry land, or would like to avoid the more challenging rapids. Many optional activities and tours such as the Canopy Adventure Tour, a visit to the Cabecar indian comunity, a day-break walk or a massage treatment in Jawa Juu Spa are also available. The Pacuare Lodge’s philosophy is a simplistic luxury and oneness with nature. One important thing to know… there is no electricity in the lodge. A wild adventure amongst comfort and relaxation for the newlyweds! This exclusive hotel features seven one-bedroom and three two-bedroom Deluxe and Superior Villas, nestled into the jungle and designed with a quiet elegance that highlights local arts and crafts. Each accommodation has a spacious open-air living area with comfortable seating and hammocks. The waterfall pool offers another inviting spot for guests to relax away from the beach. Flor Blanca’s open-air restaurant hugs the beach and is the meeting point of jungle and sea. Nectar Restaurant uses the freshest, seasonal and local products available from organic farmers to create varied menus based on their crops, truly giving guests a real "farm to table" experience. A visit to Spa Bambú is an experience of sheer indulgence that can be combined with a visit to the open-air yoga studio or to the fitness center. Flor Blanca is specifically designed as a low-impact, private resort, with only ten unique villas on seven acres of white sand beach. A path leads to a wide beach where you can walk or jog for miles, while collecting shells, beach glass and smooth stones. If you like to cool down, natural pools form at low tide which serve as calm waters. There are lounge chairs, towels, lotions and food and drink service on the beach at Flor Blanca's entrance. The paradise experience that will complement your honeymoon vacations in Costa Rica! Staying at Latitude 10 is like staying with good friends at their luxury beach house. Guests will experience personalized service and attention to detail in a relaxed, yet classy atmosphere. The resort features five spacious free-standing casitas spread over seven acres of private beachfront property, in the bustling beach town of Santa Teresa. Casitas have wooden structures with no windows and there are no locks on the doors and no air condition. Bathrooms are completely open-air with large hot water showers and gardens. It is more than a lovely room, it is a structure enabling you to sleep and rest completely in harmony with nature. The dinning, bar and lounge area are located in the central Clubhouse overlooking the pool, with a stunning ocean view. Meridian Room at Latitude 10 is a space where health is a natural condition. In this unique room, guests can experience a great variety of massages, health specials, private yoga classes or esthetic treatments like wraps, exfoliations and facials while enjoying an amazing view of the Pacific Ocean. There are many activities to choose from: surf lessons, standup paddle boarding, kayaking, horseback riding and biking in Santa Teresa. Latitude 10 is a model for sustainable development and tourism. This eco-friendly resort has chosen to demonstrate that sustainability and comfort can truly go hand-in-hand. A unique beachfront option in the North Pacific Coast of the country! Le Caméléon Boutique Hotel is a member of the Small Luxury Hotels (SLH). It is located within walking distance from the beautiful golden sands of Cocles beach, between the Reggae town of Puerto Viejo and the fishermen town of Manzanillo. The elegant and contemporary decor cleverly melds with the rustic ambience of the Caribbean coast. The mantra at Le Caméléon is “Every day is a new day”. The decorative elements and lighting within the rooms are changed every day, just like a chameleon, adding a sophisticated warmth and sense of fun. This is a contemporary hotel with rustic elements and a minimalist decor, that creates a relaxing and elegant atmosphere, specially designed for the upscale traveler. Le Caméléon features 23 guest rooms and Suites. The hotel offers its guests an international first-class cuisine restaurant, a nice, cozy lounge bar, a Spa, a swimming pool and sun deck, and outdoor Jacuzzi. A comfortable way to enjoy the Caribbean side of Costa Rica! If you are looking for a completely different honeymoon vacations then, Tortuguero will be a great choice for you! Peace and nature are mixed in this magical place, where you can celebrate with your soulmate this special occasion. Manatus is one of the few properties that sit directly on a strip of land separating the Caribbean Sea from several canals. The exclusive dwelling is home to only 12 bungalows with 2 Queen beds each, making it as a unique place to stay as the scenery that surrounds it. The privacy here is felt not only in the small size of the hotel and the personal feel, but also in the care shown in providing comfortable amenities to make each visit as enjoyable as possible. All bungalows blend privacy with luxury, starting with a private patio with an outdoor shower. A romantic way for refreshing together! Beyond the bungalow lies the perks of the main building. Visitors can access a spa, gym and swimming pool while taking advantage of laundry service and the sumptuous restaurant with a la carte international menu. There is also a bar where guests can enjoy delicious drinks after a morning full of discovering and learning, while relaxing with a book, a great conversation or simply by enjoying the landscape. Manatus hotel also features some private trails to enjoy the natural surroundings and the possibilities to observe the characteristic wildlife of the region, as well as a panoramic dock where you can relax and enjoy the views of the calm waters of the lagoon. A refreshing pool can be found in the property too. If you want to experience another kind of adventure, kayaks can be rented to cruise the canals while tours are available to see birds and other creatures of the canopy. And, you will want to experience a truly gourmet dining experience while staying here! Don’t miss it! Now, if all this information is not enough, here we provide you a few links to other great properties too. Surely you will have a better idea of what to consider and chose for your honeymoon package in Costa Rica.